This is your Web Host's home that was completed in August of 2014. 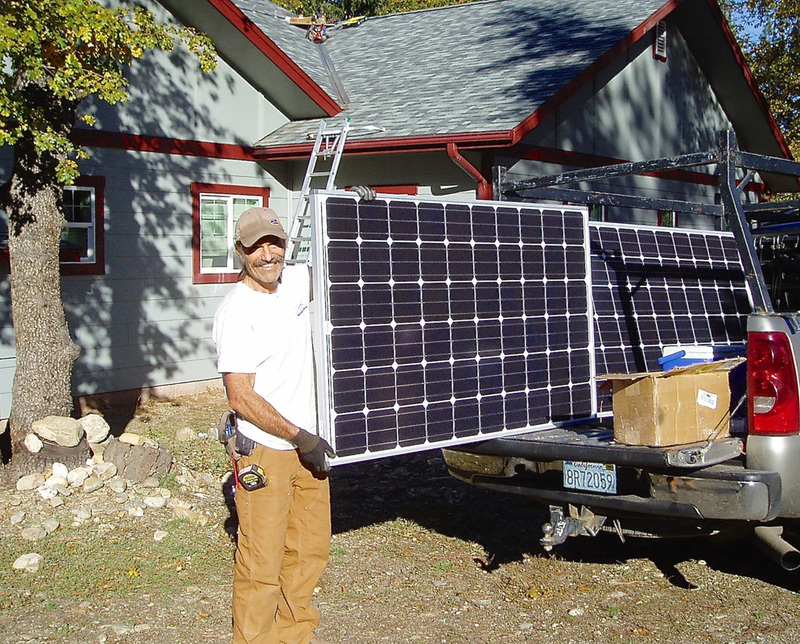 The solar PV installation was added and testing began on November 12th. The annual billing evaluation period commenced with Pacific Gas & Electric on December 9th and will continue each year. At that time, electric power net consumption will be billed, or generation credits beyond household use will exceed total annual consumption. 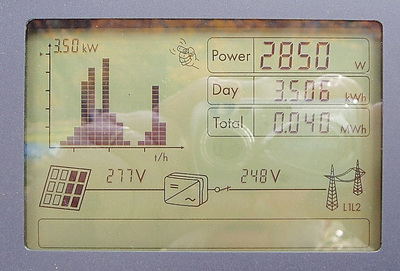 This is called Net Energy Metering and the surplus electricity by solar power is credited at the retail metered price. 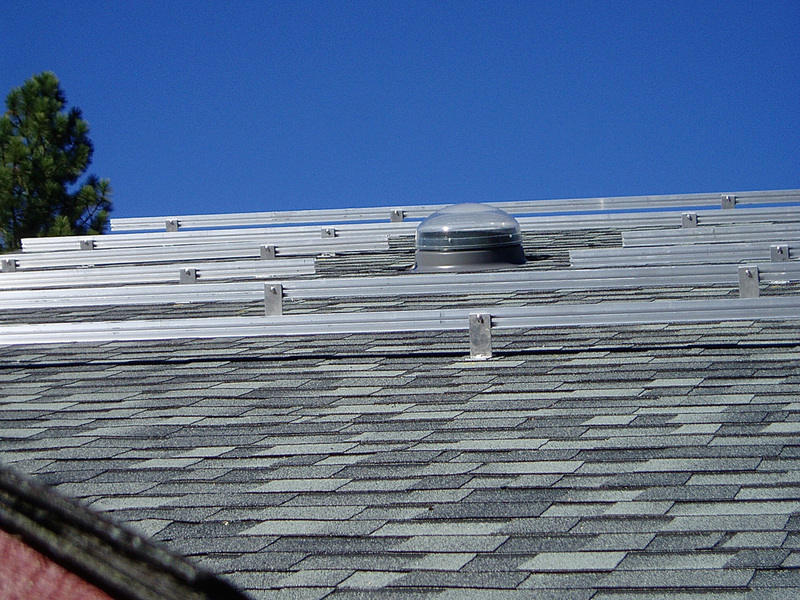 There are 31 panels in this array at a tilt of 22.5°, (the angle of a 6/12 roof). The array is approximately 523 square feet of area, facing South 5° West. The house has 3,265 square feet of conditioned living space and is all-electric, using no gas, oil, or wood. It is intended to achieve carbonless Zero Net Energy. Heating and cooling are provided by a 3-ton geothermal heat pump supplying three ducted zones in this one story home. The closed loop, underground heat exchanger is composed of four 800 foot slinky® loops at a seven foot depth. Hot water is supplied by a standard, 80-gallon electric hot water heater whose contents flow through a timed circulation pump throughout the building to put hot water close to every tap. This hot water heater is supplied not from a street connection but from a 50-gallon storage tank, configured to accept de-superheater-supplied water from the heat pump on a separate pumped loop. The unheated storage tank receives make-up water from the street. De-superheater-equipped geothermal heat pumps make hot water whether they are running in heating or cooling mode. Most of the interior lighting is LED, and most of that is driven by dimming switches. 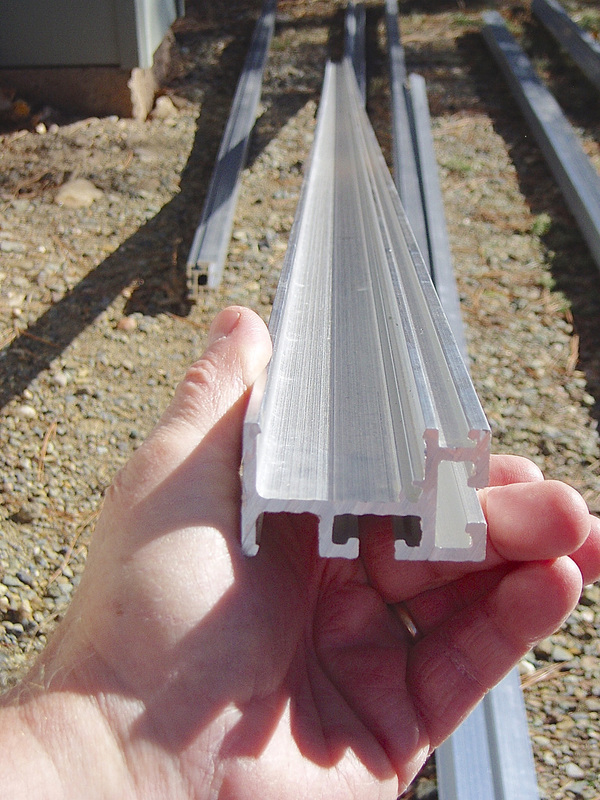 All windows are lowE coated and rest in insulated vinyl frames for an R-value of 3.7. Ceilings are R-50, walls are R-32 with nearly absent thermal bridging by framing, and floors are insulated to R-30 over a vapor-barriered crawl space. These construction elements are all conventional. "Where the actual energy produced on-site through renewables is equal to the building's energy use over an entire year. The grid and the ground serve as our electric and thermal batteries, and no carbon-based fuels need be pumped, trucked, leaked, or combusted." Commercial solar photovoltaic installations higher than one megawatt in size (one million direct current watts per hour) are built as generation investments and their compensated price per Kilowatt-hour is at a much lower, wholesale price. 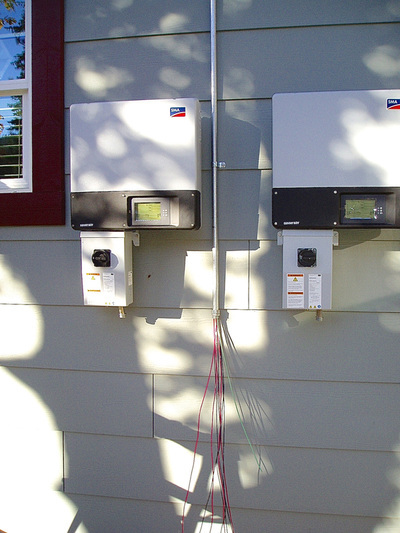 The two images below show the overall way that Net Energy Metering works and an illustration of the race for more solar photovoltaic power installations among the nation's utilities. California is well represented in this race. 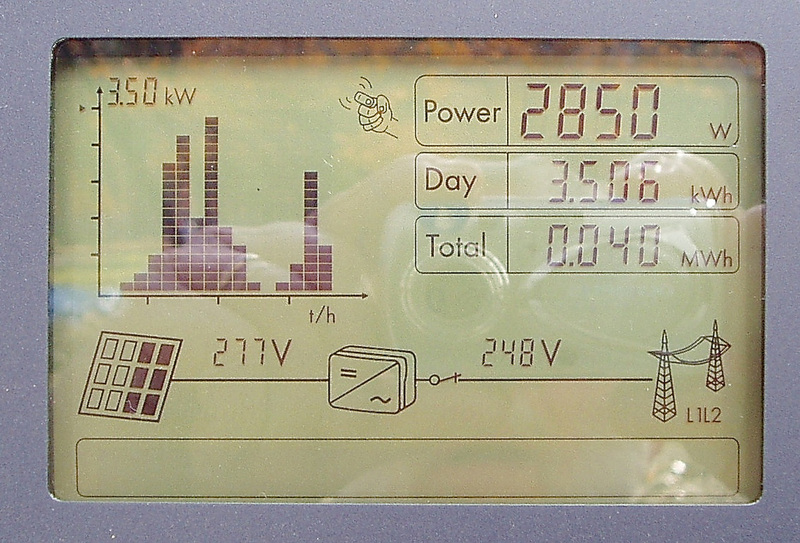 If you do the math, you'll note that 31 panels multiplied by 275 watts equals 8,525 watts (or 8.5 Kw). But this system is officially rated at 7.4 Kw as a net amount after seasonal and weather losses, inverter inefficiency, and panel tilt angle. What the house (above) doesn't use goes backward through the meter and onto utility lines where it can be used by others in the neighborhood. A primer on the basics of electricity flow precedes the remainder of descriptions/photos of this residential installation. Electricity is a flow path of electrons that is tapped to provide work of some kind for us. Electrons jump along the outside and through the interior of a conductor. In most cases we are talking about conduction through wires of various sizes, but lights, microchips, solid state circuitboards, appliances, and kitchen microwave energy are all powered by this source from the powered end of such conducting wires. As in the physics encountered with liquids, gases, and many elements in chemistry's Periodic Table— those electrons don't move around willy nilly, they need a reason. In this example, Mr. Volt is the forward push that wants Mr. Amp to flow through the conductor, but Mr. Ohm has other ideas— trying to restrict the forward movement of Mr. Amp. If Mr. Volt was lots stronger, or if (in addition) Mr. Ohm was weaker, then Mr. Amp would be moving along nicely through the conductor. Conductors (including wires) are of varied qualities. They should be matched to the loads they need to serve. For example, you wouldn't extend a standard extension cord three houses down your block to power their 10,000 Xmas lights, would you? The farther you intend to travel with your Amperes, the better the conductor and the higher the voltage you need. 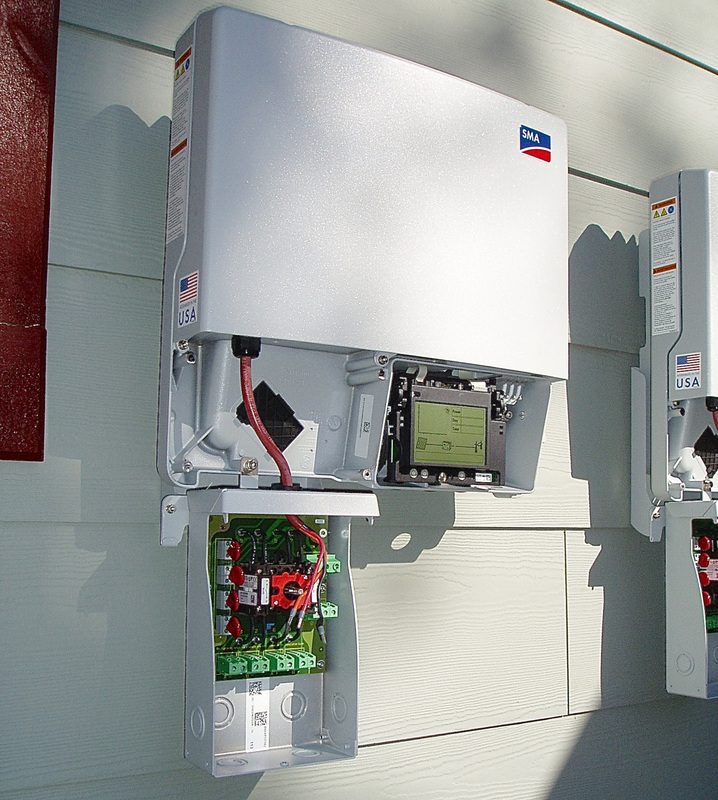 The common power distribution supplied to a U.S. home is 120 volts. 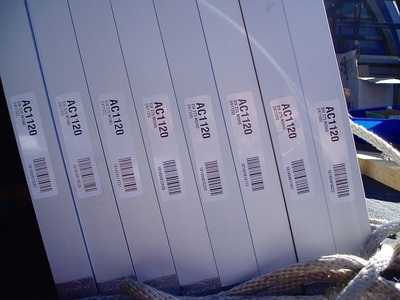 The lights in your house and all the common duplex receptacles (plugs) are 120. Your electric dryer, electric oven, stove, and water heater all run on 240-volt current, and they obtain this by tapping two 120 volt conductors. Each of the members of this appliance group are providing HEAT by using electrical power, and their conductors are specified accordingly to provide LOTS of resistance to current flow, which generates friction and thus heat. That is, the conductors at the point of the heat generation are built that way— the wires taking the current there are not. They are designed like all other electrical circuits in residential, commercial, or industrial use—let the electricity pass easily (and safely) to its point-of-use. The example (at right) has parallels to the operation of electrical power and flow. The only way you could adequately drive four sprinklers from one faucet and hose was if the pressure was maybe 125psi instead of the standard 60psi. And if your utility's water main was lower than standard pressure and too many of your neighbors were connected as you were, you might have far less than 60psi to work with. Live up a hill from your water meter? You might have even less. We must compensate in the same ways for electricity flow. Distribution lines to our neighborhood from the utility come toward us at 12-15,000 volts. This is needed because there are so many miles of such lines and resistance to the flow of electricity (Ohms) is the inverse of voltage. 1 ÷ voltage = resistance, so the higher voltage flows more easily. If you review the cartoon illustration above, you'll recall that higher voltage reduces a conductor's resistance to current flow. Smaller wires on a utility's poles are far cheaper to install. But that high voltage must be reduced to a pair of 120 volt lines before it enters your house, and even though the distance is short, those wires need to be thick to overcome resistance. For that, a transformer is involved. 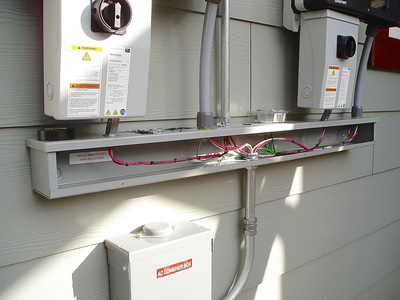 High voltage through bare, skinny wires attach to the top of that transformer, and two fat, insulated conductors with 120v each leave the front of the transformer, feeding your main electric panel from overhead or underground. Inside a transformer is where separate coils of wire from each direction are spiraled in close proximity to each other. This "steps down" the incoming high voltage to a desired level, and this sizing of transformers is designed by electrical engineers. This was a description of utility pole mounted units. There are also ground surface units and others that reside underground in a vented vault. You've probably heard them hum. If you feel confused about the transformer concept, go look at your plug-in chargers around the house. Portable shavers, cell phones, cameras, computers and many other things charge on micro voltage, stepped down from your 120 volt standard receptacles through "cube-like," plastic-encased plug-ins. There are other transformers for your car, too, that start with 12volt power before going with micro voltage to your phone or iPod. It's all the same transformer physics and nothing to worry about. (At Left) Service entrance cables from the utility's transformer go through your meter and terminate under the lugs at the top of this panel. The two 120 volt conductors enter a main circuit breaker and then, may pass (if the main breaker is closed) into flat aluminum plates called bus bars. The bus bar's job is to carry power downward through the panel, and they branch toward the centerline with upward, raised prongs to which distribution circuits can be connected by the use of smaller circuit breakers. 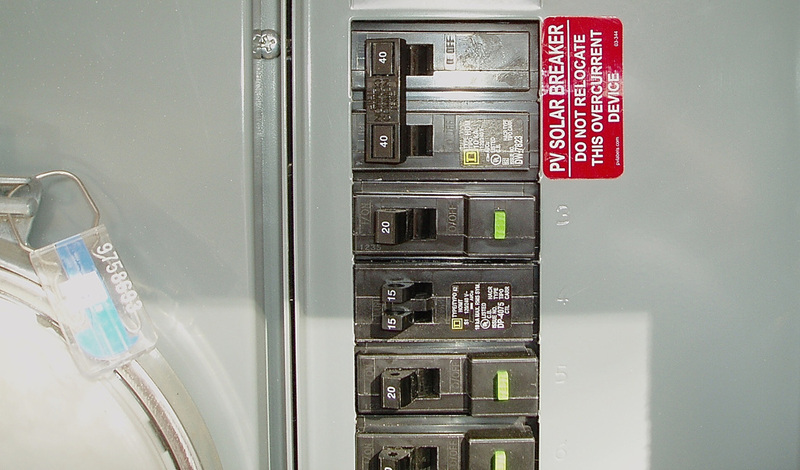 (Right) The lower portion of a two-bus panel showing standard household circuit breakers (the kind that replaced old-style "screw-in" fuses). The yellow line represents the points where raised prongs (above the flat bus bars) provide a point of connection for the circuit breakers. Breakers labeled X, Y, and Z each power both a red and a black conductor. They are "double-pole" breakers and their undersides connect to prongs from both bus bars. The conductors each convey 120 volts to the destination but the two switches are fastened together, and we call this a 240-volt breaker. All other breakers in this photo only touch one bus and are therefore 120 volt circuits. 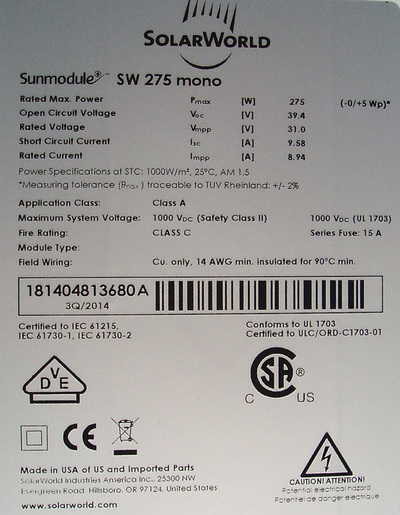 There is a tandem, single-pole breaker (lower right). It drives two circuits with 120 volt power, each. 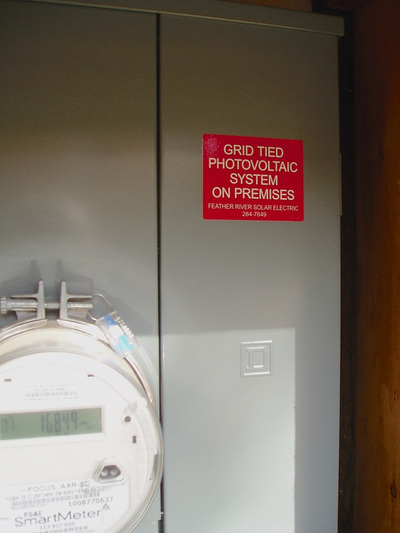 Understanding what bus bars and circuit breakers do is fundamental to tracing the pathway of solar-generated electrons from your photovoltaic array. They represent that potential reverse pathway for solar energy to satisfy your building's electrical loads and for any surplus to go backward through your utility meter on the way to your utility's high voltage lines. In case you've wondered what happens when utility power is out and your solar panels are in sunshine, here's the deal. Any generation of electricity by you on your building site (if passing through buses, like those above) could push back through a utility transformer, assume high-voltage status, and electrocute linemen working on fixing the outage problem. 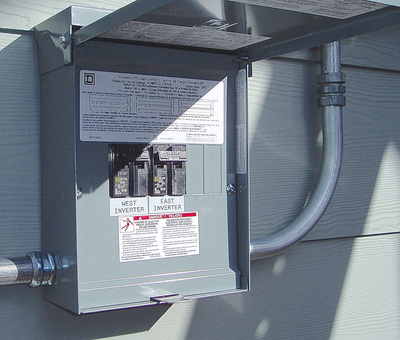 In the case of a home generator inter-tied to your main panel, a special switch (double-pole, double-throw) is required so that when you run a generator to make up for lost utility power—it is the only connection to your home electrical system (severing the connection with the utility). 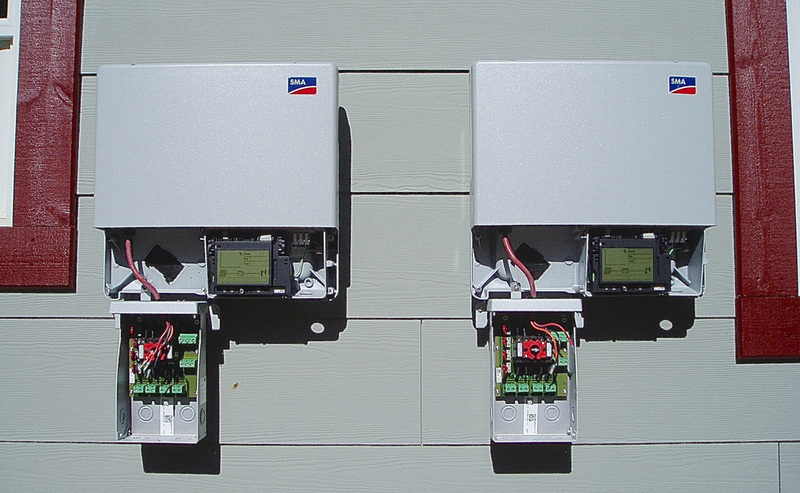 In the case of a solar electrical system, modern inverters on the solar side of your main panel are able to sense a utility outage when it happens within thousandths of a second, and they will cease power production. 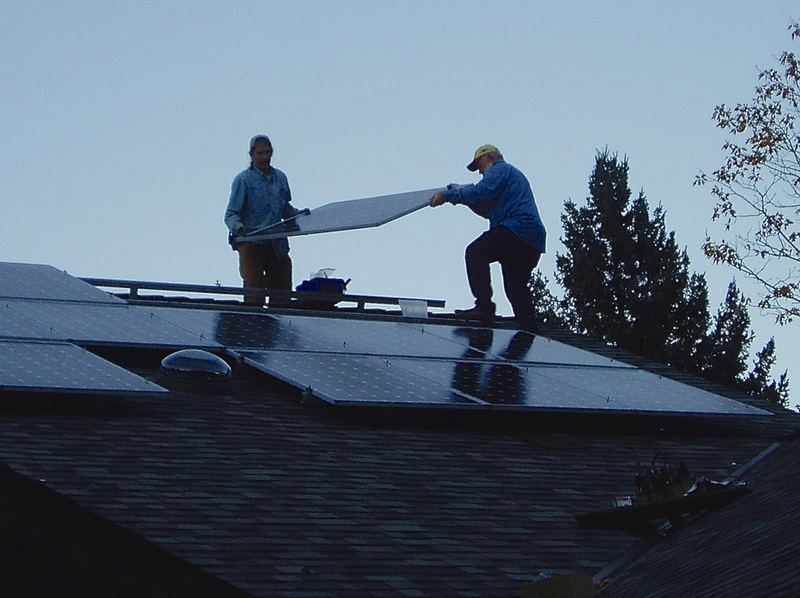 This solar PV installation was conceived very late in the construction phase of the subject house. 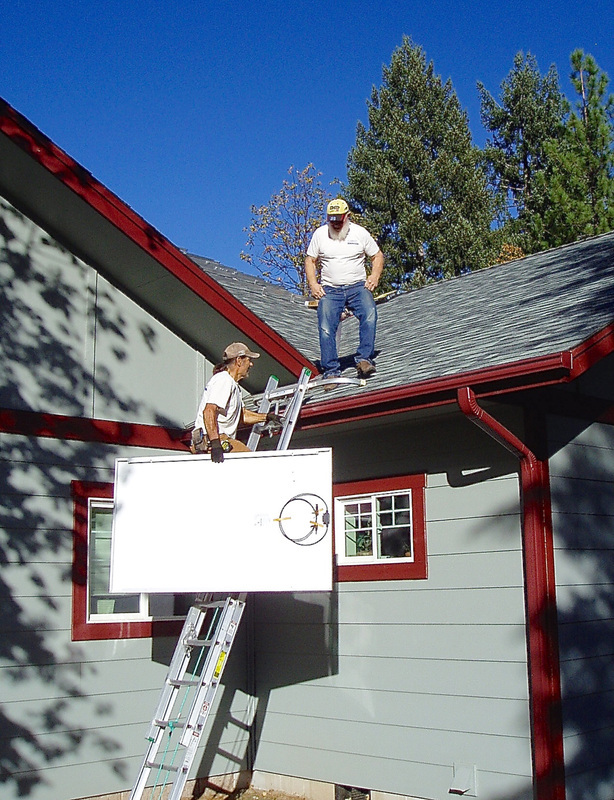 The prior plan was that electric bills to run household loads would be low enough to tolerate billed charges and therefore protect mature trees on the south exposure of the home from removal. Although the usage amounts were reasonable for the 3,265 square feet of conditioned space—the consumption (and monthly bills) during a temporary occupancy period were considered too high, and with an all-electric house using more than average power due to heat pump operation—this put us into higher tier-priced electricity billings nearly every month. 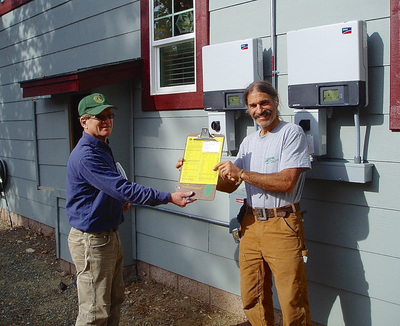 Although geothermal heat pumps are very "grid-friendly," there are no rate adjustments to baseline allowances or pricing that supports this fact. Therefore, it was time to consider solar and get comfortable with the removal of some south and southeast perimeter trees. 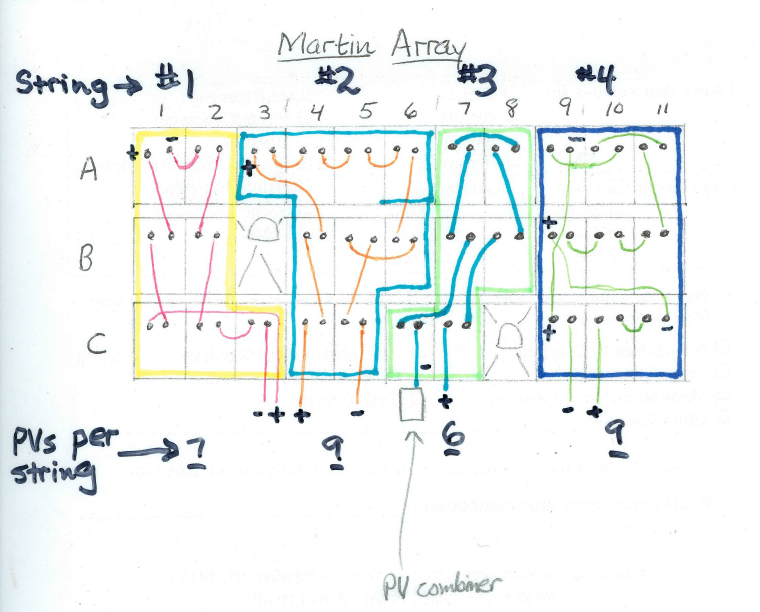 We had a couple of proposals from solar contractors who (with instrumentation) performed a complete analysis of our designated roof area, estimating what proportion of full sunshine could be obtained from an array. We chose a local solar contractor (at right) who had been installing solar PV for over three decades. Having worked with this technology myself for our RV needs, I still felt hiring a pro was the best move (and that quickly turned out to be correct). 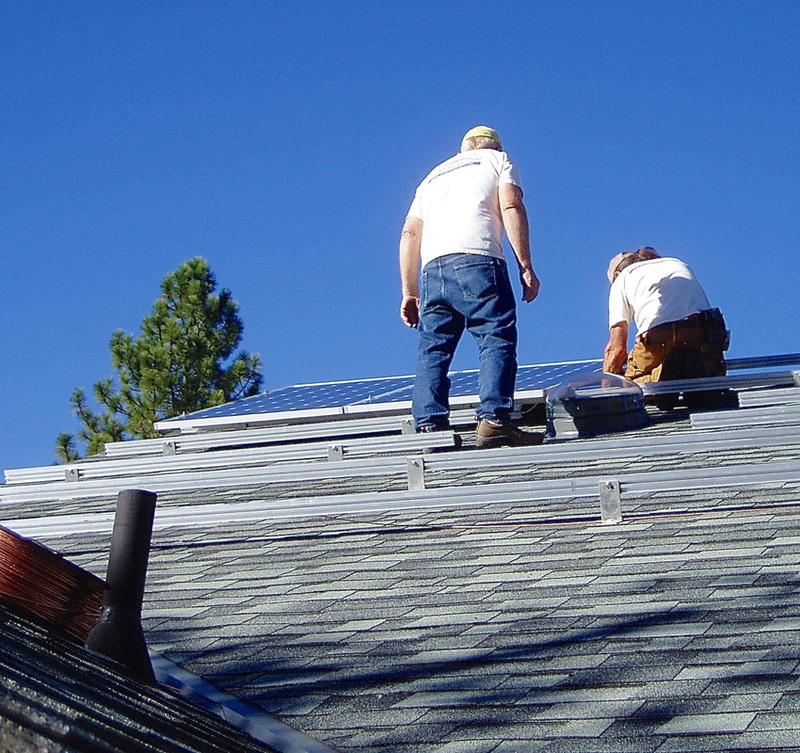 With a minimal down payment by us, this contractor had an attractive 10-year finance option that let us keep our 30% renewable energy tax credit. Our contractor has lived off-grid since the 70s, and drives diesel vehicles that run on used fryer oil. He is a strong believer in what he does and when people asked what I thought of the job he did for us, I got used to using the phrase, "He does things just the way I would do them myself—only better and faster." The reputation for good work spreads fast in smaller communities like ours and this man will stay busy! Part of what we should be looking for in a solar installation whose panels will likely last 25 years is that the rest of the infrastructure should be permanent and require no maintenance. That means absolutely no wood and no steel because both need paint and both could become weaker over time. 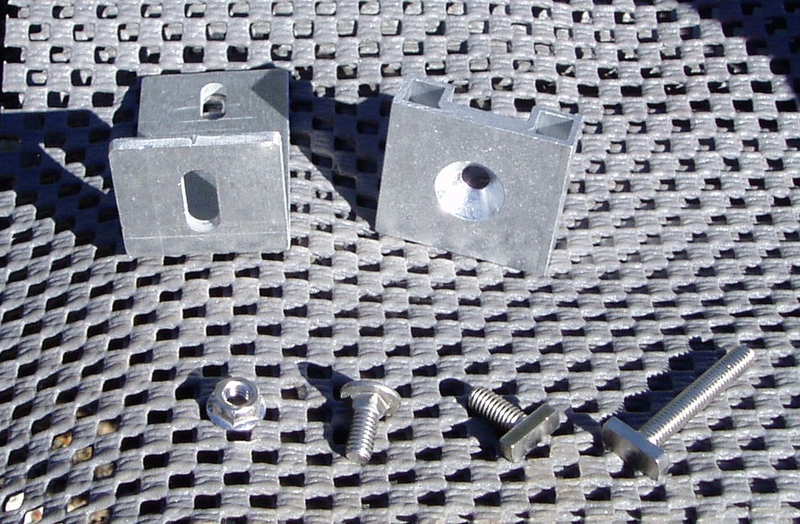 Therefore, the preferred material is aluminum with no ferrous metal in the fastening hardware. Ferrous oxide (rust) and galvanic action (corrosion) are chemical reactions that need to be prevented in this exposed environment. 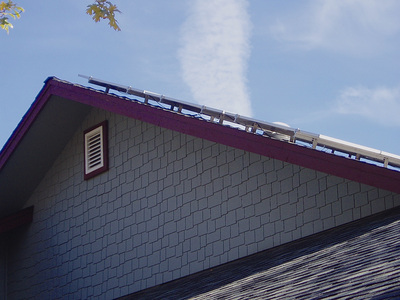 In the gallery below, notice that the rack supports and top panel clamps are made of cast aluminum, and the long racks and the frame supporting and surrounding the solar panel are made of extruded aluminum. 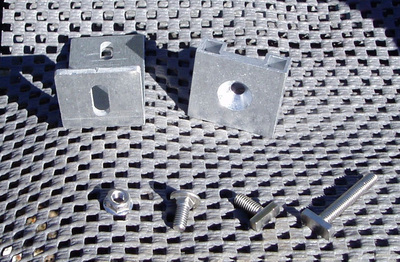 The fasteners are made of stainless steel. Stainless steel and aluminum are proximate partners on the galvanic scale and therefore are safe for direct contact w/o corrosion. The pair of inverters (lower right) are weatherproof but the installer prefers that in this particular mounting location (outside, on a south exposure), they should be shaded to improve efficiency. Hot wiring & components increase electrical resistance, so a vented enclosure around this infrastructure is currently under construction. Mounting hardware, panel racking, solar collectors, and power Inverters—the major elements of a system. The rest is just standard electrical parts that handle direct and alternating current electricity. The building of this solar panel array fastened 31 panels to positions along six rows of roof racks that had been lag bolted through shingles and decking and into wood rafters. The roof ballet featured Bill Battagin and Art Gustafson, who have worked together intermittently for over 20 years. Bill built custom wood stoves and installed them before going solar in '82, and Art is a long-time flue installer and chimney sweep. Their confident and steady travel on our roof reminded me of ironworkers on skyscrapers or bridges. I use the term ballet because tippy-toeing on an incline without grab bars while not tripping over rack rails (especially backward, down slope) while carrying panels or tools, is not as easy as these two made it look. Every panel was lifted and carried up the ladder and then moved to its position on the racks. Nobody stumbled or tripped, and no panel was dropped. Once the panels are firmly anchored to the racks and the roof, wind is no longer a factor in this installation with the panels acting as sails. 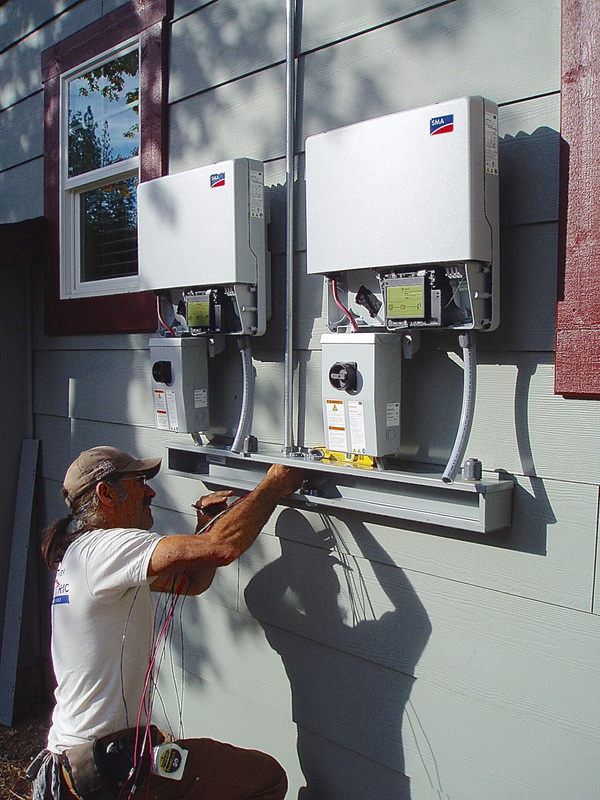 It's time to provide the wiring infrastructure that will get solar power to the two inverters, and then onward to the main AC service panel. The first step is to complete any (series) connections that remain as per the array map above in the previous photo gallery. 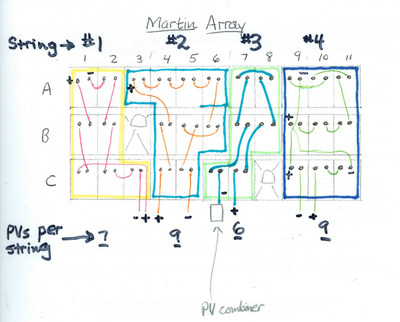 The next step is to take the eight wire feeds from the four strings of panels (one positive red and one negative black from each) and bring them together in a combiner box below the full array whose outbound path will be to enter the attic. The wires will run in a 1" galvanized EMT conduit into the attic and then southward to the south gable wall before exiting outside and downward to a large raceway below the inverters. Two pairs of conductors will feed to a DC switch serving as a ground-accessible shutoff. Now that there is alternating current (AC) driven by the solar photovoltaic panels, there needs to be a way to get it to the household for utilization and to export it past the meter to the utility for some retail generation credit. 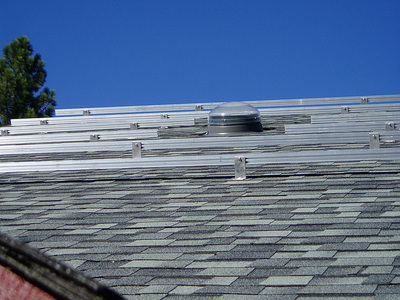 The sun doesn't shine 24/7, and winter days (and household needs) are big consumers of energy to run our geothermal heat pump, hot water heater, cooking, laundry, and greater use of lighting at the same time when the days are very short and sunshine approaches at a low angle of incidence to the panels' surface. 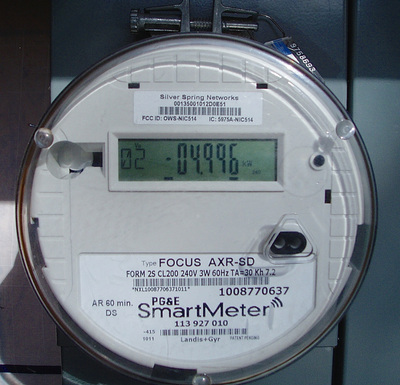 On the Pacific Gas & Electric E-6 all-electric rate, a Kilowatt hour exported between 1pm and 7pm is worth 33¢ if our use is within the baseline allowance tier price between May 1st and October 30th. That export is worth over TWO Kilowatt hours during winter rates, so let's get busy making the grid our solar battery! This process is not that far removed from the beaver, who caches branches with tender bark for next winter under water near his lodge, so that soft, nutritious bark is available next winter when the pond is frozen over and access to trees and shrubs is reduced. 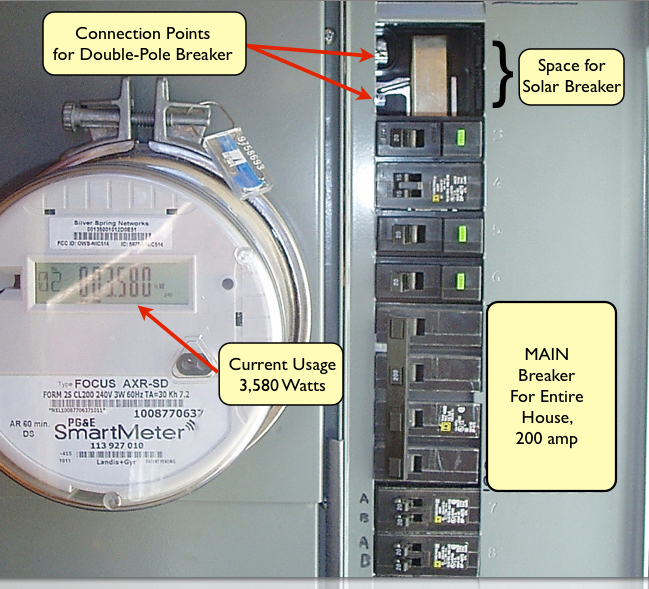 This kind of connection to the utility is called an Inter-tie, because in addition to the usual one-way path of electrons into the house from the utility (consumption), we now have another possibility going on where we produce AC, and what our house does not use goes back through the meter and onto PG&E's lines (export). The meter actually runs backwards. This solar photovoltaic system was turned on for testing on 11/12/14 and was accepted by the utility into the NEM (Net Energy Metering) Program on 12/9/14. We will receive monthly statements as to our power consumption and export, and on next December 9th, the NEM year will close. 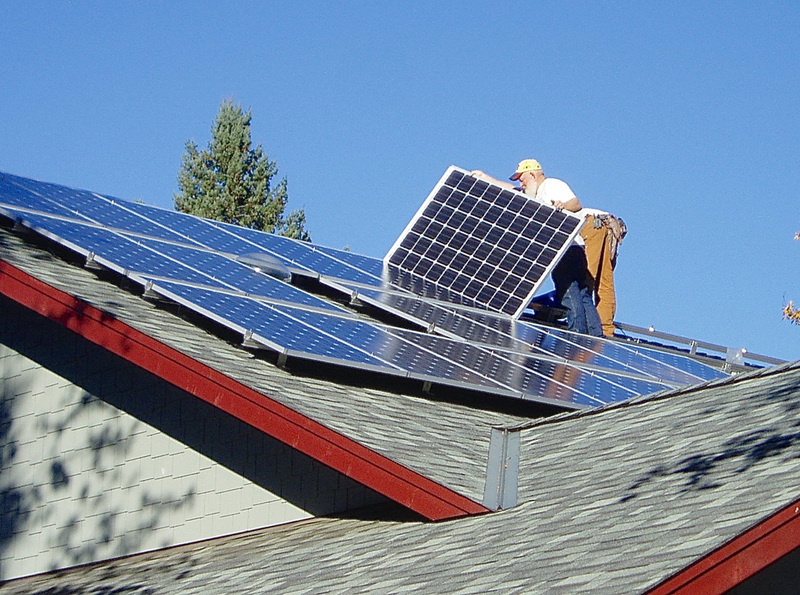 Shortly thereafter, we'll receive our annual "true-up" billing and will then know if we've ended with a zero electric billing for the year, where the generating credits earned have exceeded the cost of our usage. There is also a possibility that we will generate the same number (or greater) Kilowatt-hours over the year's time than we have used. 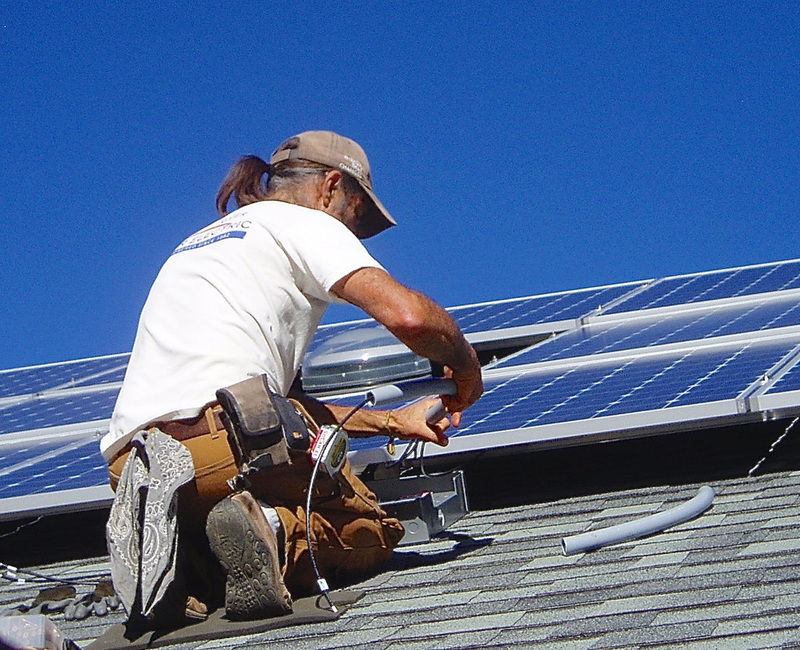 If that happens, we will be truly "Carbonless, Zero Net Energy," where all our thermal and electrical loads were generated from either the geothermal heat pump we use (that connects to an underground, thermal resource) or the rooftop solar we deployed to create all necessary electricity. Will this be the Quincy ZNE House? Yes, it was. 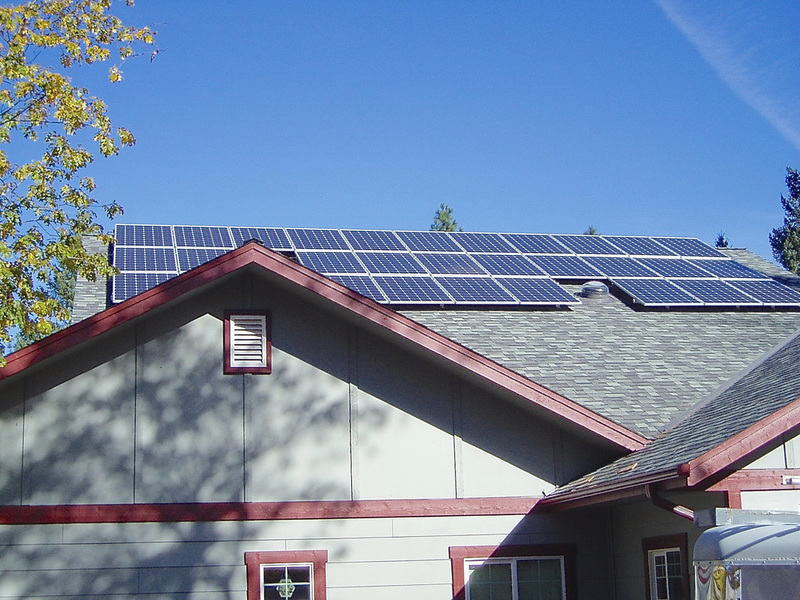 In its first True-Up year, this house exported 1,503 more kilowatt hours than it consumed. 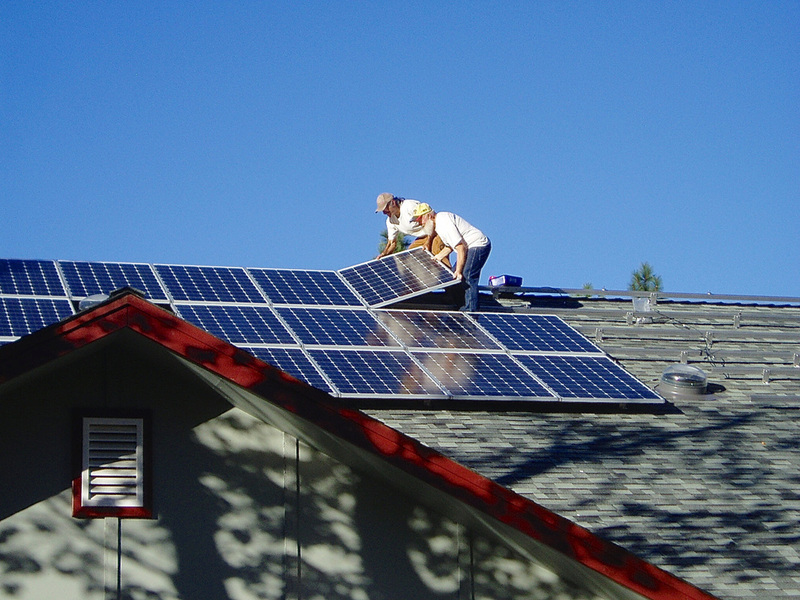 So, it was Zero Net Energy POSITIVE !